Players try to keep their snouts ahead at all times. A player who plans and plays his cards at the right times, will be rewarded with lots of food. The player with the largest food supply at the end of the game is the winner. 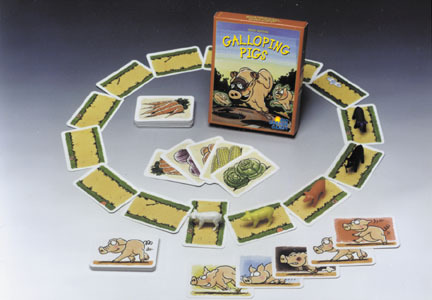 Galloping Pigs is a fast card game that is easy to learn and a lot of fun for the whole family. Galloping Pigs, designed by Heinz Meister, has been around awhile, but I never had the chance to play until a few weeks ago. I've found this to be a cute filler game that takes about 20 minutes to play. Rules are simple enough for children to pick up, so this makes a great family game. The game starts by laying out cards to form the track. Five plastic pigs, each a different color, are placed behind the starting line, one pig per card. Players are given seven cards, each one having a single color on it. On a turn, a player plays a card to move the pig that matches the color of the card. Normally the pig will move one space forward, but if a pig is there, he moves to the next available space. If a move makes a pig go to the front of the line, the player gets a food card. The game continues like this until everyone has played all their cards. The final play is an important one, however, because a player can only keep his food cards if his last card earns food. This is the trick of the game, as you have to plan ahead and hope that everyone else's plans won't mess up your own! After three such races, the player with the most food wins. My kids love Galloping Pigs. I've seen it go over well at the high school game club and with adults. Rio Grande just released a new edition with slightly different pigs-another sign that this is an enduring game that many have found entertaining.